Lateral epicondylitis, which is commonly referred to as tennis elbow, is a painful condition that results from overuse. 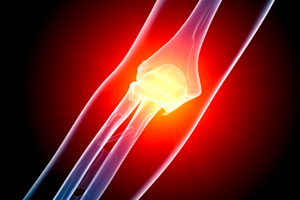 It occurs when tendons that connect the muscles of the forearm to the outside of the elbow become damaged and inflamed, which leads to pain or burning in this region. Tennis elbow is—unsurprisingly—most common in tennis players, but it can also affect other athletes and anyone who performs a motion that involves the elbow over and over. Although there are several treatment options available for tennis elbow, there are no national guidelines or overall consensus for the best way to treat the condition in Australia and the U.K. One treatment that is still commonly used is steroid injections, even though several studies have shown that physical therapy and a "wait and see" approach lead to better results in the long term. An important tool that patients can use to determine whether a treatment is worth using is called cost-effectiveness, which calculates its value based on the cost and how beneficial it is. With this in mind, researchers decided to analyze the findings of a powerful study called a randomized-controlled trial (RCT) to compare the cost-effectiveness of steroid injections to physical therapy for treating tennis elbow. In the original RCT, 154 individuals with tennis elbow for at least six weeks were randomly assigned to one of four treatment groups. Group 1 only received a saline injection, which was the placebo treatment, while group 2 received the placebo plus physical therapy, group 3 received the steroid injection, and group 4 received a combination of a steroid injection and physical therapy. Injections of either saline or steroids were administered to each patient's elbow, and they were all told to rest for 10 days, and then gradually return to activity afterward. Patients in the physical therapy groups received treatment through a program of eight 30-minute sessions. These sessions consisted of various strengthening exercises for the wrist and upper body, as well as manual treatments given by the physical therapist, and all patients were instructed to follow a home-exercise program as well. Following these interventions, all participants were evaluated to see whether they improved and which treatments were most cost-effective. On the whole, the results of this RCT favored physical therapy over steroid injections for tennis elbow. Physical therapy was found to have a greater initial cost since it was carried out over eight treatment sessions, but it was the only intervention that resulted in a significantly greater quality of life for patients. Steroid injections led to some short-term benefits, but they did not last in the long-term when compared to physical therapy and placebo. Furthermore, there was little evidence to support these injections as a cost-effective treatment for tennis elbow. On the other hand, a detailed analysis suggested that physical therapy is highly likely to be a cost-effective intervention for this condition based on its impact on patients. The combination of injections and physical therapy produced both high costs and very variable outcomes for patients. Based on these findings, investigators advise against the use of steroid injections and instead recommend physical therapy as the first-line treatment for tennis elbow. Individuals with this condition should, therefore, keep this information in mind when making treatment decisions and strongly consider physical therapy services to in order to experience the greatest improvements.